You are currently browsing the tag archive for the ‘blossom’ tag. To celebrate the blossoming cherry tree, I made a big painting on cheap canvas and hung it beside the cherry tree. It’s a little hard to get the sense of the scale, but it is the largest work I have made on canvas. The painting is an allegory of humankind’s place in the natural world (like most of my paintings). Against an ultramarine background, a giant glowing furnace monster is prancing on the back pf an aqua colored flounder. Inside the furnace chamber a little blossom person bursts into flames, powering the great contraption. Behind this tableau, a titan’s head festooned in weeds sinks into the mud (an amphora in the left corner is likewise settling into the muck). A cherry tree blooms against the night sky…along with a piece of kelp and a glass sponge. A goosefish watches the entire scene from the right foreground. Sadly, I forgot to paint the giant clam which was supposed to be beneath the flounder. Fortunately there is a sad squid at left to represent the mollusks within the painting (although I am not sure why he is standing around). Although the work is less finished than I would like, I think it successfully combines humor with a certain wistful pathos. Let me know what you think (or if you have a wall which needs a giant mural). Hypothetically, sometimes, at one’s day job one has a pushy colleague who loudly demands things and stridently lobbies for oh say…all new office furniture. It is a conundrum whether to simply bow to the wishes of the assertive colleague who demands a credenza from the internet, or whether one should go to one’s superiors and assess whether this is the right use for the office credit card. One could potentially be caught between bickering superiors fighting over a cheap credenza. Hypothetically. In unrelated news, office credenzas come packed in extremely heavy cardboard boxes. This cardboard seemed perfect for building something, so instead of throwing it into a landfill, I cut it out and brought it home to build into strange new life (thereby erasing any unpleasant office politics which may or may not have been involved in its acquisition). 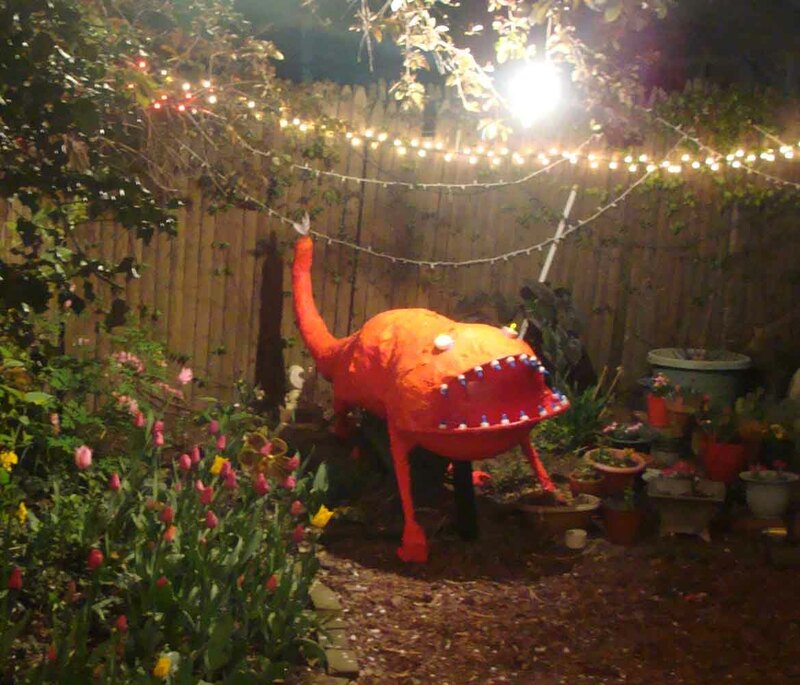 Last year I crafted a three-dimensional anglerfish/horse type monster in bright fluorescent colors to go with the blooming cherry tree. This year I decided to build three ambiguously shaped blossom monsters out of the heavy cardboard from some, uh, office furniture. The first monster (chartreuse, at the top), was meant to represent the life giving power of spring clouds. He is a cloud creature squirming with tadpoles–or maybe Yin/Yang spirit energy…however the guests at my party thought he was a three eyed camel with sperm on him (which I guess is also true, from a certain point of view). I wonder if Henry Moore had to deal with this sort of rough-and-ready interpretation of his abstract sculptures. The second statue, which may be the best, is an orange figurine somewhere between a wise bird and a tribal warrior. It has the cleanest lines and the best paint job and it is only marred by a slight tendency to curl up (there is always something! Especially if one is dealing with cardboard sculpture). Finally I made a sort of pink octopus/sphinx with a glowing pink interior. Again one friend looked at it and said “It’s a Pierson’s puppeteer!” (this being a meddlesome three-footed, two-headed extraterrestrial super-being from Larry Niven science fiction novels). So, I guess my blossom monsters are more evocative and more ambiguous than I meant for them to be (I was sort of thinking of them as a cross between Dr. Seuss and African carvings). Please let me know what you think! Oh and here is a colored pencil drawing of the orange one cavorting beneath the cherry tree! 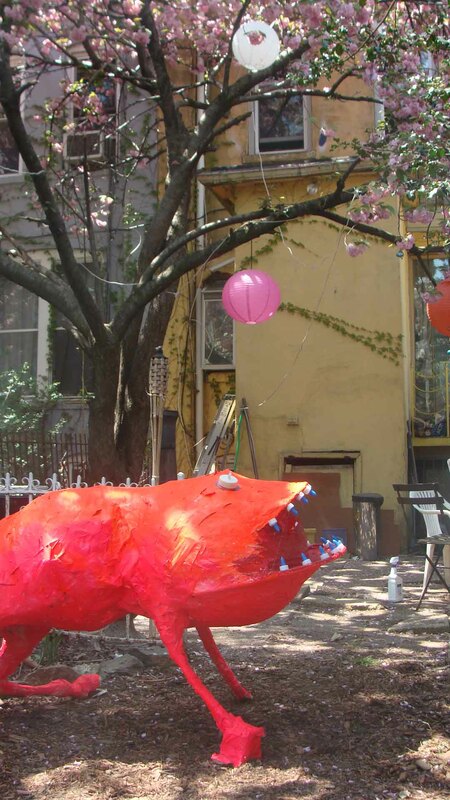 Last year, for a cherry blossom viewing party, I laboriously built a human sized blossom monster out of papier-mâché. But what does one do with a blossom monster when the party is over and the blossoms have fallen? I really meant to throw him away. Yet, somehow, whenever I went to discard him, something else always came up. He was lurking in a different part of the garden..or it was not garbage day. There was always and excuse to save the fluorescent monster, no matter how threadbare he got. But winter was not kind to him: he had sunk to the ground and his legs were coming off. One of his glitter lantern eyes was gone. It really was time for him to go (plus I made a new group of blossom monsters to celebrate this year’s cherry blossoms). So I had to toss the poor art creature (a fate which will seem instantly familiar to arts professionals). However, once I threw him in the garbage he gained his creative fulfillment. Indeed the pathos of the discarded monster was quite moving. His last act was his finest and now I will forever think of him like the maimed protagonist of a Caravaggio religious painting, with divine light shining on his fallen countenance. Today’s post touches on larger aesthetic and moral issues, but first let’s showcase some weird art! This is “Blossom Monster” a 3 foot by 7 foot chimerical monster which I made to celebrate the annual reappearance of the cherry blossoms. It is a sort of cross between a deep sea fish, a scorpion, and a horse. 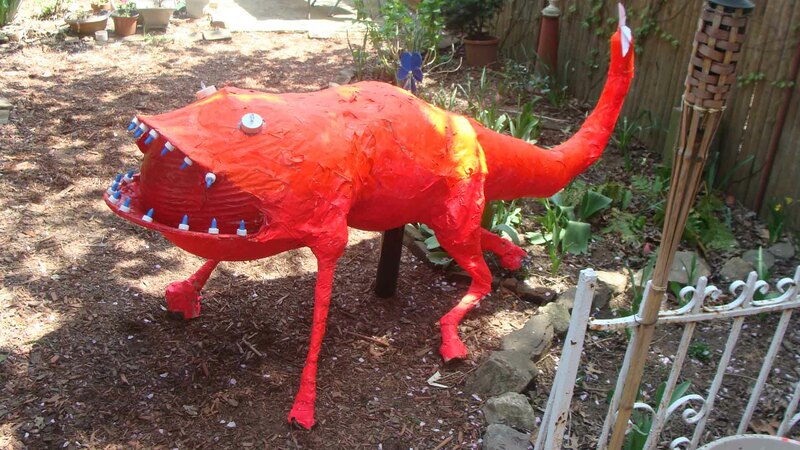 The creature is crafted from paper mache (or papier-mâché?) and has LED-light up eyes and fluorescent pink skin which glows faintly in the dark. 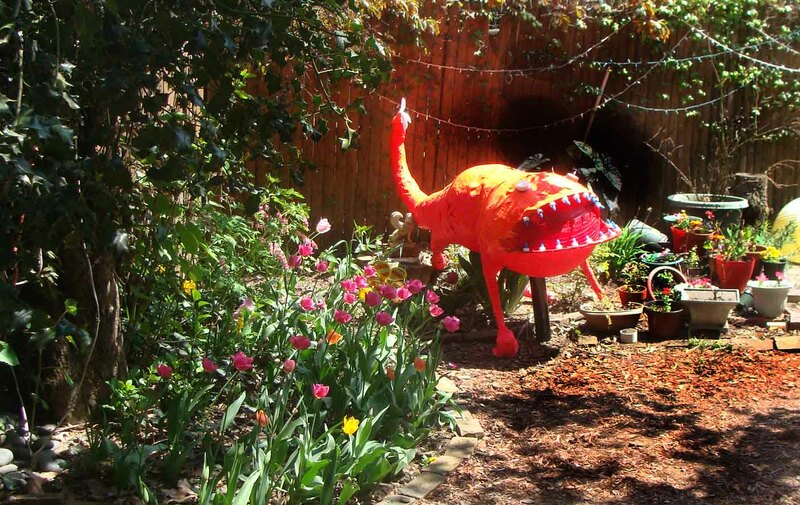 I initially placed it beside the tulip bed, but then I realized it was on top of the iris, so now the creature has been shuffling aimlessly around the garden looking for a permanent display spot. “Blossom Monster” is made of discount glue which I bought in bulk from the 99 cent store, so, as soon as it rains, the sculpture will probably dissolve into a heap of gelatinous ooze and that will be that. There is nothing more beautiful than cherry blossoms, so why did I make a weird ugly fluorescent monster to go with them? I have a story to answer that question: every year the Brooklyn Botanic garden has a famous cherry blossom festival which is attended by tens of thousands of people (at the least). Although I think the tree in my garden is prettier than any individual specimen they have, the Botanic Garden has orchards full of Kwanzan cherry trees along with hawthorns, quinces, magnolias, plums, horse-chestnuts, and other splendid flowering trees. The effect is truly ineffable—like the Jade Emperor’s heavenly court in Chinese mythology. Yet over the years people became bored with the otherworldly beauty of trees in full flower, so the Botanic Garden was forced to augment their festival by adding odd drum performances, strange post-modern theater, and K-pop music. They also invited cosplayers–so now the blossom festival is filled with space robots, ronin, mutant turtles, and provocatively attired cat-people (in addition to the already heterogeneous citizenry of Brooklyn). Adding layers of kitsch, tragic drama, manga, and human aspirations (of all sorts) has greatly augmented the peerless beauty of the blossoms. The prettiness of the garden has been elevated into high-art by the plastic hats, spandex, and makeup. The blossom festival now has a fascinating human element of ever-changing desire, aspiration, and drama which the blossoms lacked by themselves (except maybe to gardeners, who know exactly how hard it is to get perfect flowers to grow). Of course the shifting annual particulars of novelty do not match the timeless beauty of the cherry trees. In a few years we will all hate princesses, k-pop, and furries which will seem like hopelessly outdated concepts from the ‘teens. The blossom festivals of tomorrow will be attended by future people wearing neo-puritan garb, or hazmat suits, or nothing! Who knows? The allure of the cherry blossoms will never change, but the whims of the crowd beneath will always make the blossoms seem new. Novelty has always struck me as weak sauce, but it is, by nature, a new sauce. It needs to be drizzled on things to make them appealing (even if they are already the best things—like cherry blossoms). This is a monstrous truth behind all fads, tastes, and art movements. 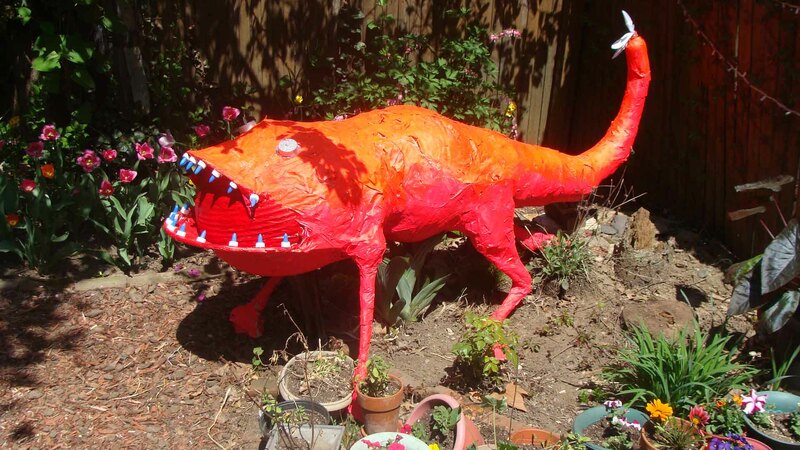 I have represented it in paper mache and fluorescent paint! Once my monster dissolves I will have to come up with a new act for next year. 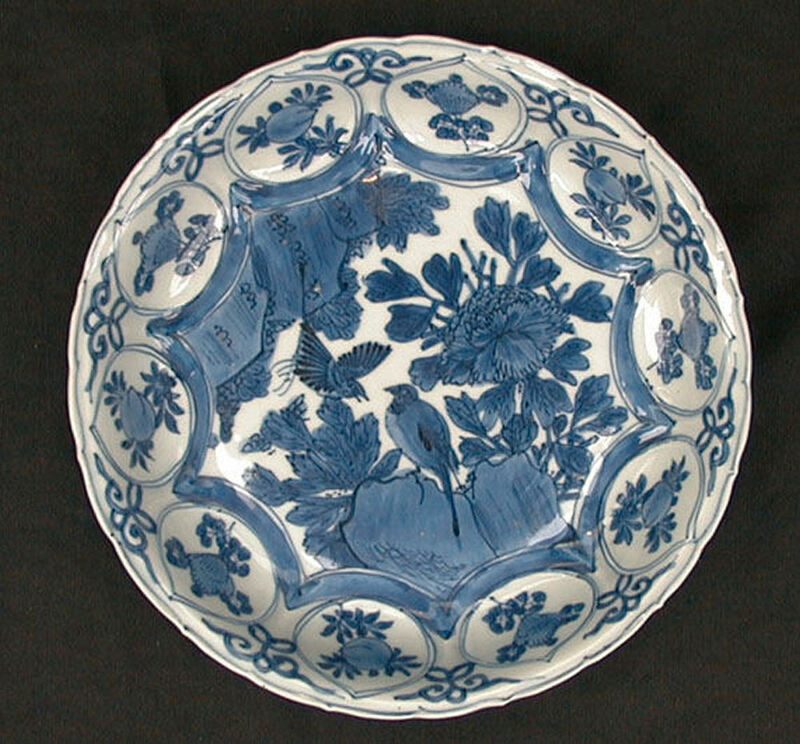 Chinese blue and white kraak dish, Wanli (1573-1619), flying birds and flowering peonies in a rocky landscape with border roundels of peach and misc flowers. Peonies are a favorite flower of Chinese gardeners. The flower has been cultivated there since before the dawn of history and it bears the title “huawang”, king of flowers, (as well as the equally lofty name “fùguìhuā” flower of riches and honor). Thriving in Northern China and the Yangtze Valley, the peony is a symbol of love, affection, good fortune, beauty, and riches. The flower’s appeal is extremely broad. In China, the peony is the consummate representative of the season of spring (summer is represented by a lotus; fall by a chrysanthemum; and winter by the wild plum). Because the peony represents such universally esteemed ideals, it is a symbol which can be found everywhere in Chinese art. 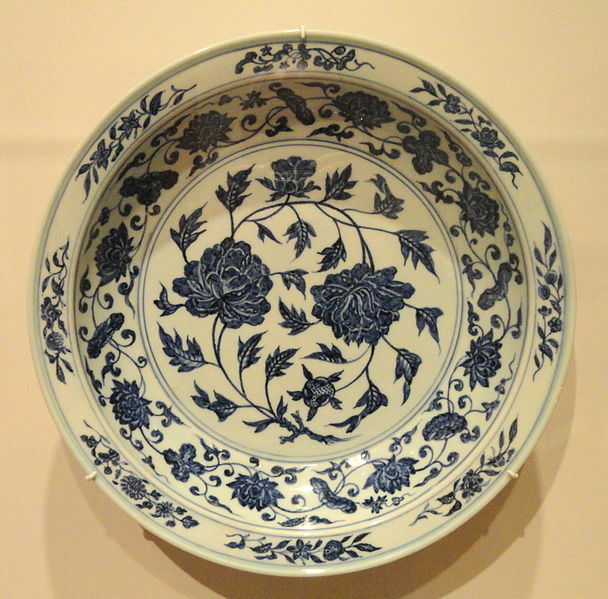 As May ends, this year’s peony season is swiftly passing away, but to remember the beautiful king of flowers, here are 3 Ming dynasty platter-bowls which feature peonies which have survived unblemished for centuries. 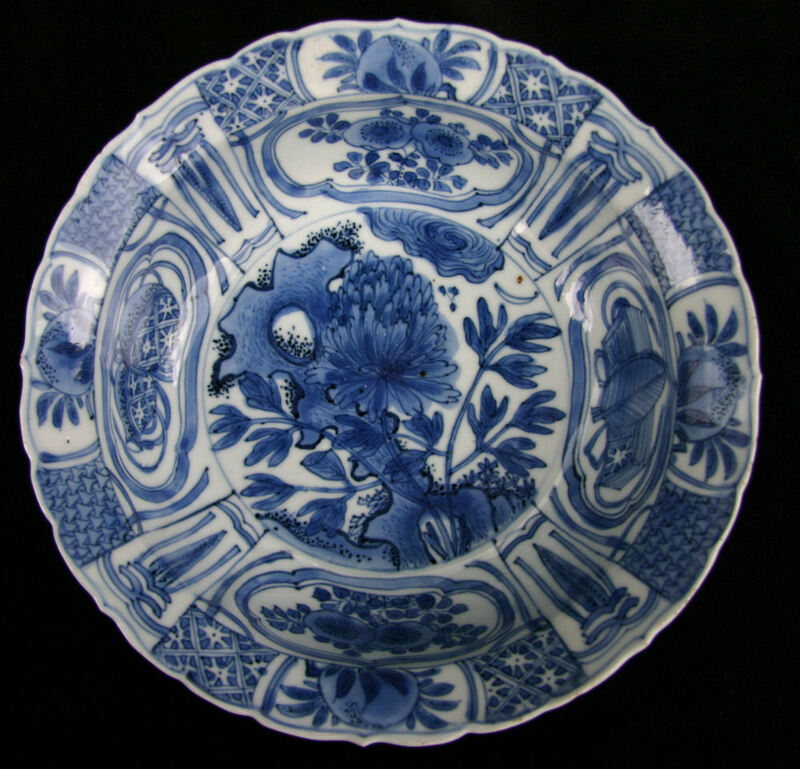 The first two are Wanli Kraaks–pieces which were made in the late sixteenth and early seventeenth century–possibly for export. The final piece is older and rarer: it is a Yongle reign platter made at the turn of the 14th & 15th centuries for a domestic patron. Look at how beautiful and elegant the brushstrokes are in comparison with the more hastily produced later work. Anyway, the happy conclusion of all this is that my new garden is much more beautiful than the old one was. The ground is rich and fertile and, best of all, some ingenious landscaper from long ago planted a variety of gorgeous trees. This forethought provides the subject for this post, for the new garden features a Japanese flowering cherry tree, the undisputed emperor of ornamental trees. The tree is old and huge. It looms high above the two story house and spreads across three (or maybe four) lawns. Such trees are the central focus of spring festivities in Japan where “Hanami” festivals have involved viewing cherry blossoms and reflecting upon the nature of life (and drinking) since the Heian era. 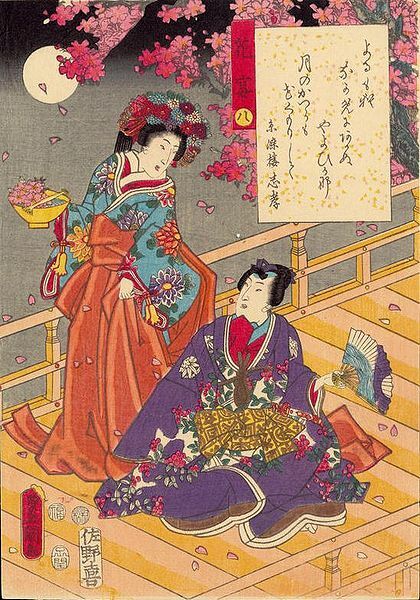 Initially such flower parties were attended only by the imperial family, but the trend of festivals for sakura viewing was soon picked up by the samurai nobility. The custom combined with the similar tradition of farmers who annually climbed up nearby mountains in springtime to have lunch under the blooming trees. Soon Hamami was adopted by all classes in Japan as a time of drinking and feasting under the sakura trees. Tokugawa Yoshimune, an eighteenth century shogun, arranged for the mass planting of cherry trees to encourage the tradition. Today, the Hanami festival is the major annual spring festival in Japan. A “blossom forecast” is carefully watched as people prepare their parties. Then when the trees are blooming, the Japanese spread mats or tarps on the ground to drink and dine alfresco beneath the falling petals. Of course many people are more interested in eating (and, more particularly, drinking) then enjoying even the most beautiful flowering trees. They are mocked as being “hana yori dango” (more interested in dumplings then flowers) and their drunken antics and passed out bodies are a major component of hanami time in Japan. 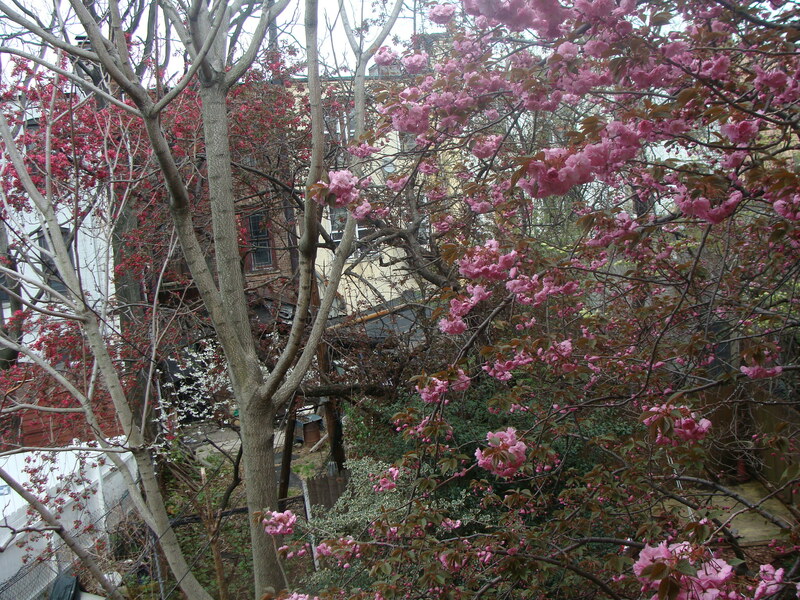 As you can see in the photos, the cherry tree at my new place is not the only tree blossoming in the back yard. It is joined by a showy crabapple tree with deep pink buds and a flowering dogwood. All of these beautiful trees mean that I’m back to shade gardening and my roses are living out front by the bustling street. I was bent on fully celebrating hanami with my friends. In the spirit of “hana yori dango” I had already thought out a menu of sake, dumplings, and grilled meats, but, due to a scheduling mischance, I will be on holiday in Los Angeles next week (which is a good problem to have). 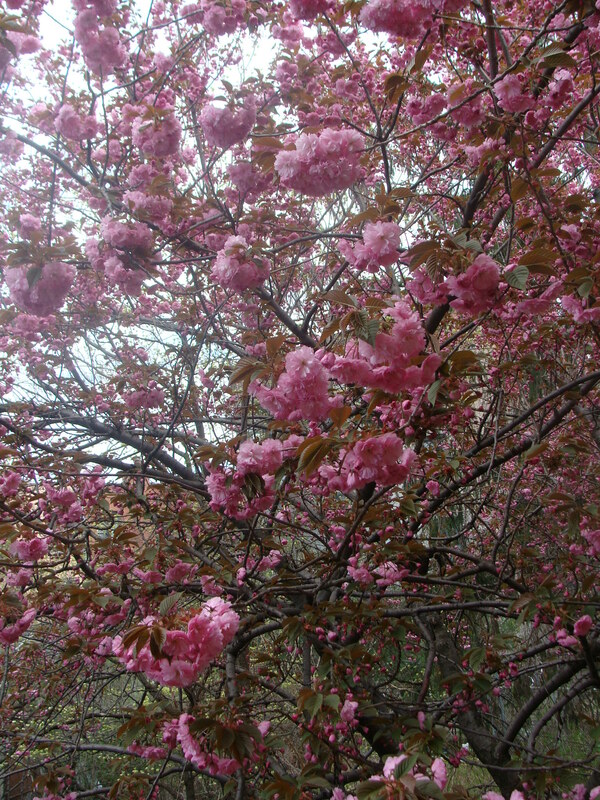 I have included photos of the initial blooms from my backyard but my roommate ensures me that the blossoms become even more fulsome as the whole tree morphs into a living pink cloud. I suppose it is fitting that I am going to miss this peak bloom as sakura blossoms are an ancient and enduring metaphor for the ephemeral nature of life’s joys. Indeed to the stoic Buddhist and Shinto faiths which have taken root in Japan, the blossoms are symbolic of the brevity, beauty, and fragile nature of life itself. 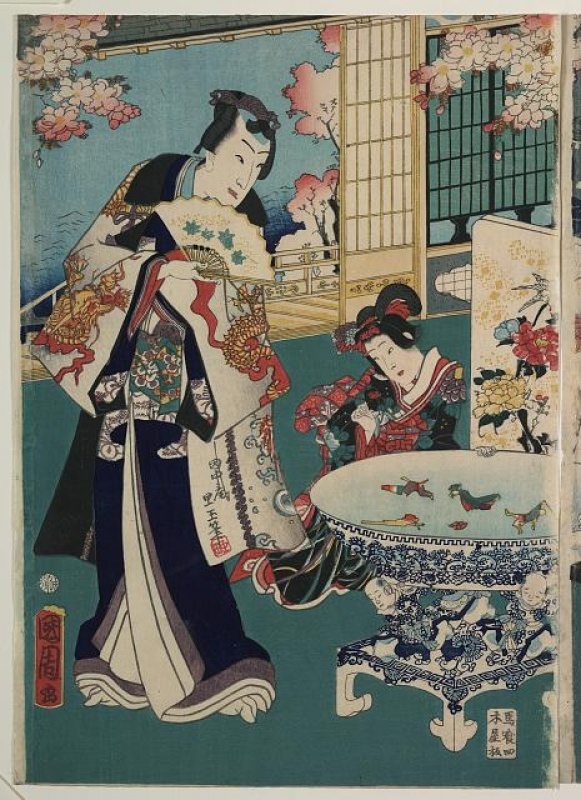 "Under the Cherry Blossoms" (by Kunisada, 1852): This could have been me!